There is a fixed canon – that certain texts have the authority of scripture, and all others are permanently excluded. There is – though we fallible humans may disagree about what it is – one definitive and correct interpretation of these authoritative texts. A crucial point of feminist theology has been that the very expectation that words will stay put in their meaning, and that words won’t fail us, has been a problem for us. Authority must be de-centered, they say. No finite text can save us. Liberation of both women and men depends upon opening up creative possibilities of meaning. We must make the sources of authority open ended. Bring in new texts from other world traditions. Let us write new stories. Let us make new interpretations of the old ones. Let the language which speaks to us, which has power for us, which is our scripture, be infinite and not closed off. The same words that liberate can also oppress. What matters is context. What matters is intent and purpose. There is no grand narrative that will always give everyone their due. Any story becomes oppressive if it becomes fixed, canonical. Princess Petronella, unwilling to wait around for some Prince to come for her, decided to go out and find her own. Deep in the woods she came upon an old man who told her about the house of Albion the Enchantress – and about a golden ring that could break Albion’s enchantments. Petronella proceeded to Albion’s house, where she saw a young man sitting in a lawn chair on the front lawn who identified himself as Prince Ferdinand of Firebrand. Petronella had found a Prince, and found him self-absorbed and unimpressive. When Enchantress Albion appeared, Petronella told her, “I’ve come to see if you have any work for me.” Albion set Petronella to work taking care of a kennel of dogs, after which, Petronella asked for, and received, payment of a golden ring. The next day Petronella pulled Ferdinand from his room, and the two made their escape on horseback. Soon they heard Albion in pursuit behind. Petronella threw the golden ring to the ground, and when Albion stepped over it, the ring became a trap that bound her tightly. 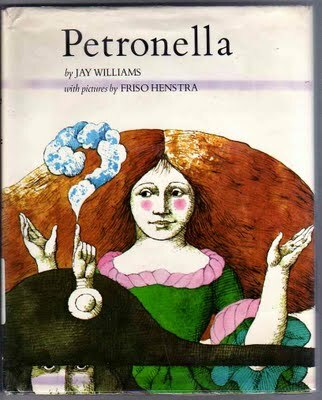 Petronella offered to release Albion if she promised to let the prince go free. Albion replied that Ferdinand was never a captive. “I am glad to be rid of him! He came to visit for a week and never left.” “Then why were you chasing us?” asked Petronella. “I just wanted to get to know you better,” said Albion. In the end, Petronella and Albion leave Ferdinand to fend for himself, ride off together into the sun rise, and live happily ever after. The twist on the traditional fairy tale is delightful. Free women get to do things their own way. The man gets his comeuppance -- and he is transformed all the way from boorish oaf to hapless irrelevance. If we had only that sort of story, then the message for men is that their role is to start off obnoxious and end up pointless. But, of course, we don’t have only that sort of story. Instead, we have a vast plurality of stories breaking down each others’ stereotypes. Any canonized set of words will always fail us, so feminist theologians remind us to look beyond the words to the context. Any set of words will fail us, so feminists remind us to resist any closed canon. In the context of a culture in which our girls and women, much more commonly than our boys and men, are seen as derivative and dependent, then a story of a princess who is not dependent on a man is a useful corrective. The point isn’t meant to be universalized, for to universalize any story would be to enshrine its stereotypes. It’s not a universal story: instead, it’s a story offered to us where we are now. And by insisting that our authorities be open-ended, that there is always room for more stories, we allow the intrinsic lopsidedness of any given story to be counterbalanced by subsequent stories. There’s no way to tell a nonlopsided story. Every story has its situated, particular point of view and cannot affect an objective, god’s-eye viewpoint. The pretense of objectivity has been oppressive. What we can do is keep telling more stories, compensating the limited perspective of one with diverse other, albeit also in their own way limited, perspectives. The instant that process stops, the instant we think we have a finite scripture, in that moment we give up on further liberation. This is part 3 of 5 of "Feminist Theology"
Next: Part 4: "Lynchpin to World Peace"
Previous: Part 2: "Whither Feminism?" Beginning: Part 1: "I Was a Teenage Feminist"